Wolf or WPA (Wolf Performance Ammo) is an industry leader in the world of ammunition. They have been producing and importing high quality, steel and brass cased, heavy duty cartridges for multiple years now. The Wolf Military Classic rounds come in many calibers, bullet designs, and with plenty of other options. They produce FMJ or Full Metal Jacket, SP or Soft Point, and the always popular HP or Hollow Point rounds. 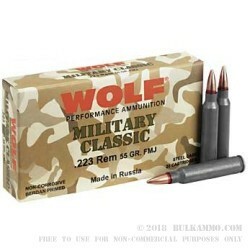 The Wolf Military Classic economy line of .223 ammo offers the shooter a good amount of ammo for a price that you can easily afford. These 55 grain .223 Remington rounds are FMJ and have a Full Metal Jacket, heavy duty construction over their solid lead core. You have 3 options if you decide to pick up other Wolf WPA rounds. They are set into new non-reloadable, non-corrosive, lacquer sealed Berdan primed, heavy gauge steel cases. These Wolf WPA loads have an impressively fast muzzle velocity of 3130-feet per second or FPS. These Wolf WPA .223 Military Classic cartridges are made in Russia and imported into the USA. Pick up multiple 20 round boxes, and go out plinking with your friends, compete in one of the many rifle competitions out there, or just test out a new rifle for function and accuracy. Get a few now and prepare for days of fun.